Yep, the kids pick their own subjects. Sometimes I veto one (Anna picked princesses and unicorns this time but I need a break from them! G!). Sometimes I make suggestions, just tossing out random words to see if anything piques a child’s interest– dolphins, China, seeds, Albert Einstein, the Boston Tea Party…. But they inevitably pick the subject themselves. This generally leads to some pretty cool information about even the oddest subject. I copy interesting text, open up wordpad and paste it in as I go. I make the font bigger and interesting. My kids like fancy fonts! 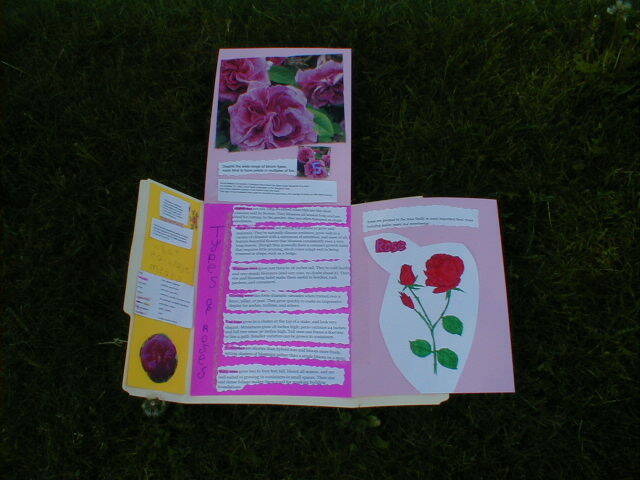 For instance, for Anna’s rose lapbook I found a list of types of roses (floribunda, species, tree, etc.) with descriptions. I also found some cool tidbits about how roses were valued throughout history, along with stories about roses in various times, trivia, etc. I pasted all that info in one document, made it bigger and prettier, and printed it out. 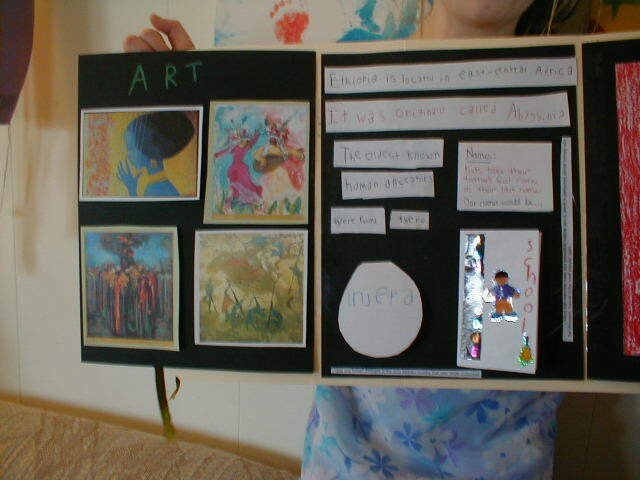 I look for handouts for kids that add to the educational value and also pictures that the kids can color or alter. At enchanted learning, I found a cross section of a flower that I printed for Anna to color in. At another site I found a coloring page of a single rose. 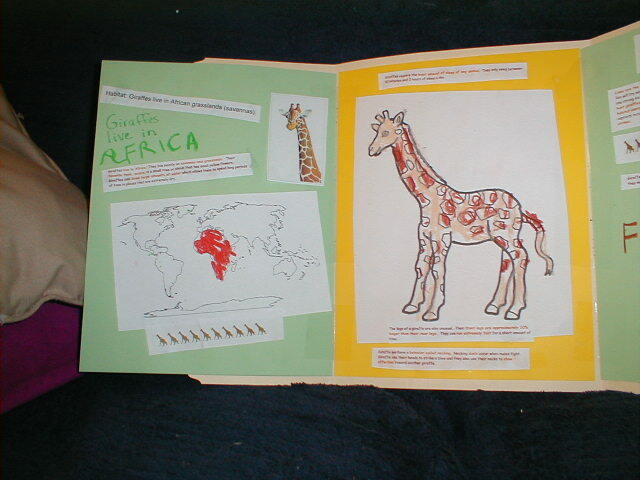 Other times I let the kids use old National Geographic magazines, catalogs, etc. to find relevant photos. I brainstorm about ways to tie in lots of subjects. For instance, I found a fact that most roses’ petal numbers are multiples of five. 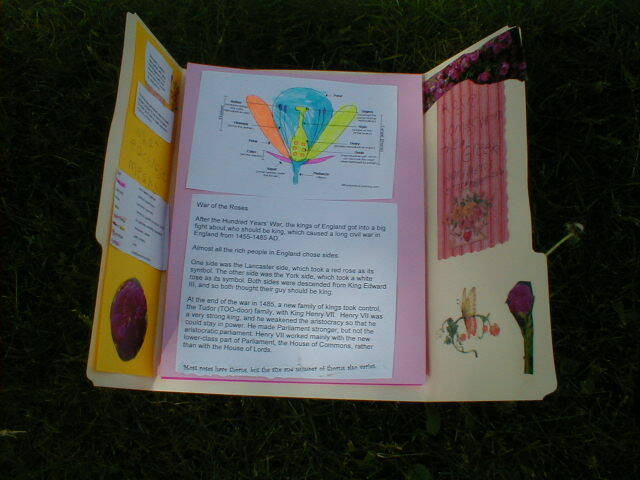 The cross section of the flower with the anther, ovule and such led to a discussion about polination and cross-breeding (science). 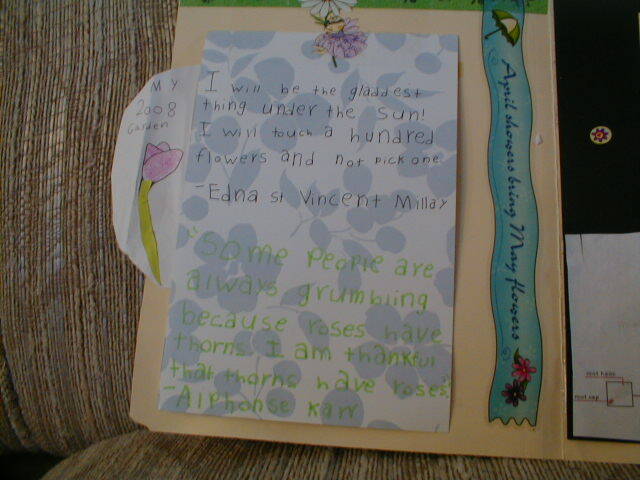 I will often look for a poem on the subject that the child can copy (literature and copy work). I tie in history. 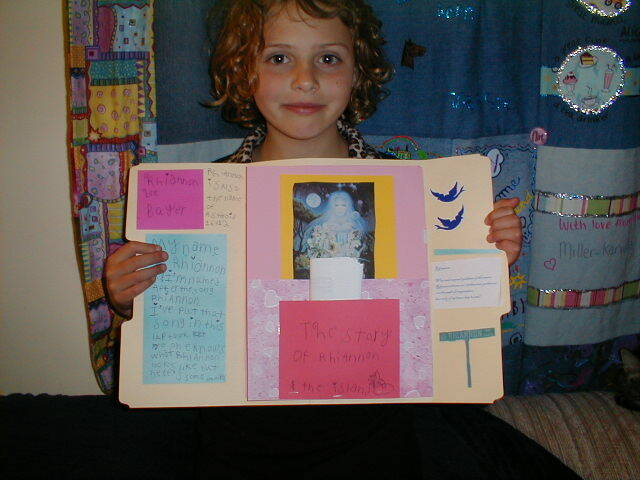 Anna’s rose lapbook led to discussions/inclusions about Cleopatra, Columbus, WWII and more. And so on. I take about 20 minutes finding info and printing out various things. Often, the child is there with me for part of the time, asking for this or that, making suggestions on other search words. While I’m searching I give them some pages to start labeling or coloring. Then I come downstairs with my pile of info and we go through it. The kids choose what they want to include. 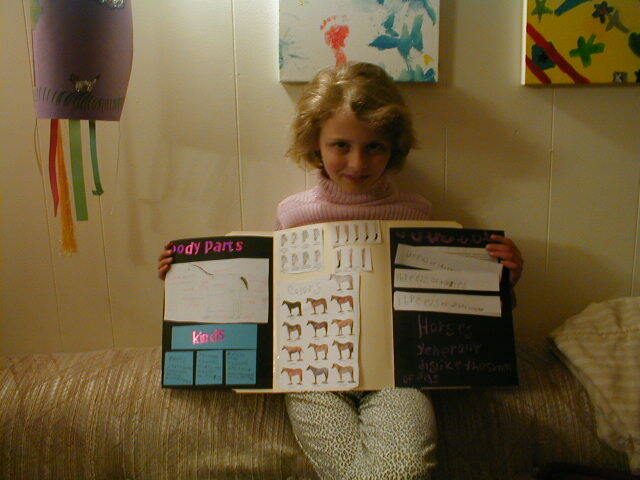 Anna routinely dismisses some of my favorite finds (the skeleton system of horses was really cool IMO but she deemed it “too gross,” for instance, LOL) but I let her have her say because I want her to continue to enjoy this. Besides, she still learns from it. It’s just not in her finished product. Sometimes I’ll make a pretty insert where I’ll write out headings and have the kids write in the information. 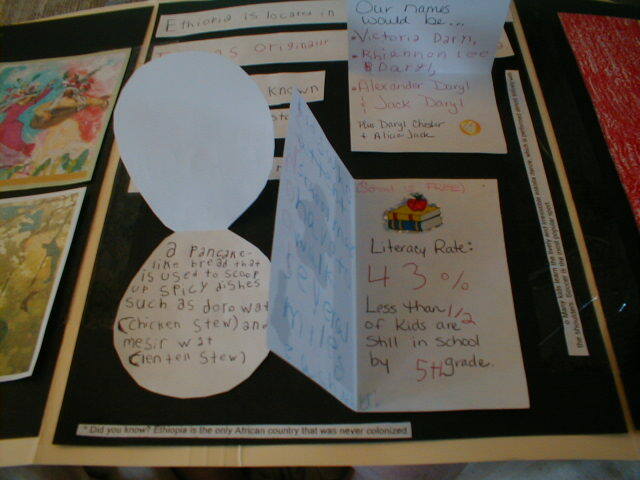 For instance, about Ethiopia I wrote words like Population, Religions and Monetary Unit and Victoria looked it up from information I’d printed out and wrote in the answers. I often help cut, since it can get tedious. I tell the kids I’m their personal assistant for at least part of the time, finding supplies they might need, helping trim, taping, giving ideas if asked. I tend to attach extra pages (using cardstock and clear packing tape along the back) and they do the rest. I often make suggestions, like saying we could make a lift-the-flap section for trivia questions or a shape book that would tie in with the theme. They’re free to take them or leave them. We take a break once or twice but try to do it in one afternoon or evening just because we are hopeless at finishing projects if we don’t do them all at once. We take a break to do something really fun and have a treat (Anna and I had a picnic snack at the field across the street and played frisbee), and then finish up. 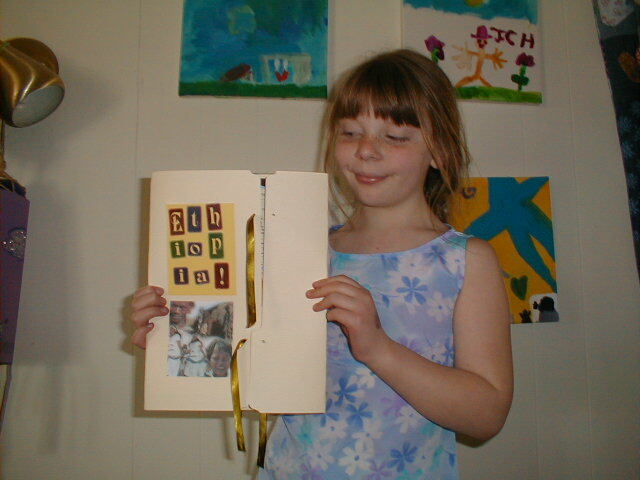 The kids present the books and show them off to loved ones, and they often sit and look through them long afterwards. We have done a few of the premade types and I found them to be more labor intensive for me (so much cutting! so many directions!) and less interesting to the kids. It is an awful lot of assembly work with not much creative license. We have a harder time finishing those too, since they tend to be pretty big projects. 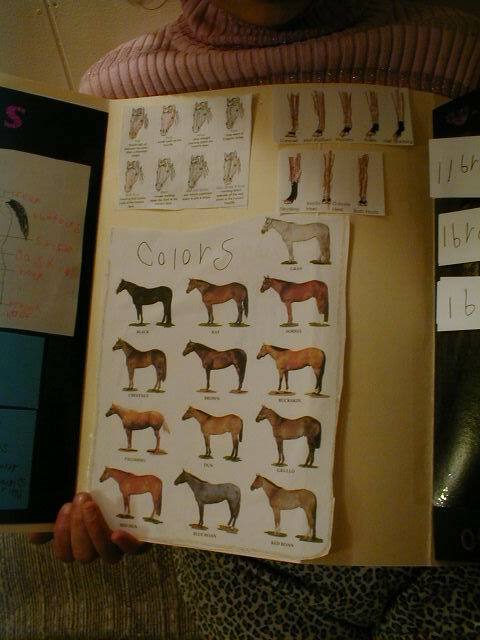 We’ve only been doing lapbooks for a few months but we don’t show any signs of slowing down. Each of the kids is asking me to start another one. I really think one key is to give them creative control, and as much power over it as possible. Doing some of the grunt work for them (especially for little ones) helps too! 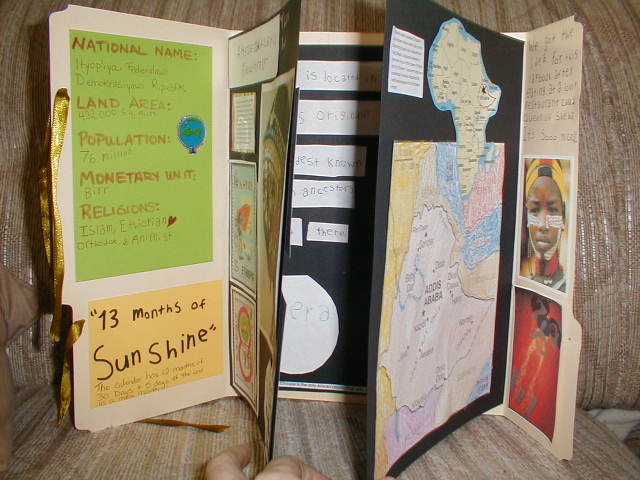 😉 So far we’ve done lapbooks on Ethiopia, gardening, the Earth, roses, fashion, cells, the body, horses, Amelia Earhart (prepackaged and unfinished but cool), addition (ditto) and a few others. All 3 kids (ages 5, 8 and 10) enjoy them and we’ve all learned a lot. Sorry this got so long! Hope it’s helpful. 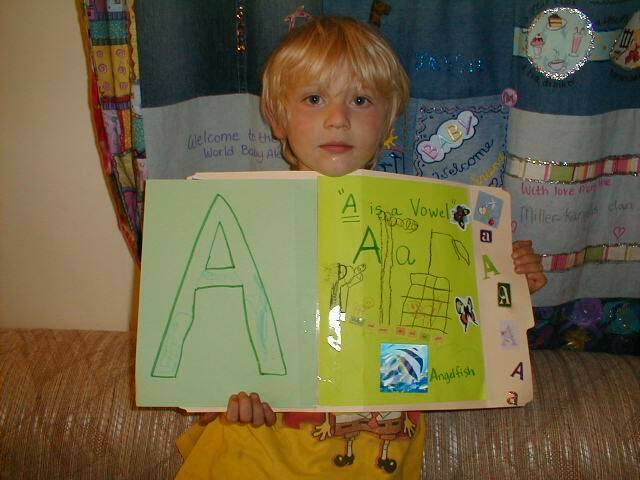 This entry was posted in Lapbooks by Alicia. Bookmark the permalink. I have looked at lapbooking “sites” and even joined a yahoo group but was just not something the kids have taken off with yet they like to do more themselves and this way sounds right up their alley as they are forever creating and cutting pasting gluing everytime i turn around and have been trying to find a way to help make their time with all that be a little more productive then all the paper i end up tossing . We are going to start one for each on their favorite stuffed animal that they each like to sleep with. So will be frogs turtles elephants and not sure what dd will want to do. Thanks again and going to read more of what you have been sharing. We had such a great time meeting you and making the ice cream and the kids still talk about that snowshoeing! Hope to get out there in the summertime to look at the writings without the snow lol. I found you by ‘googling’ Ethiopia Lapbooks (we’re adopting from there and I’m wanting to make it more personal for my bio kiddos)! I’ve perused your site for a few moments and THIS PAGE IS SO HELPFUL!! Thanks for the incredible detail for kicking out your day/project. My 5-yr old ds and I just finished our first “killer whale” LB (free download, but modified), and my 6 1/2 yr old dd is adding finishing touches to her (original) “5 senses” book. I find, though, that getting much “info” in hers is hard, as she wants only to decorate and make it pretty, even if it does not have anything to do with the theme. Suggesting copy work (a great short poem) or “favorite smells”, etc., just brought on resistance. Any ideas?